Okemo Hops in the Hills 2015 Chicken Wing Champion was once again The Killarney. 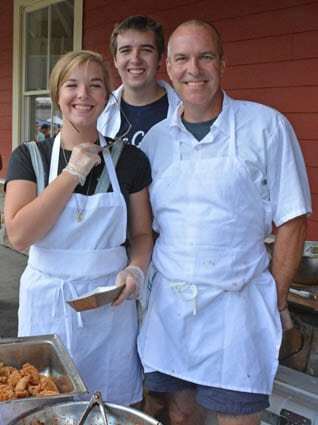 Owner Mark Verespy served up “Sweet and Savory Barbecue Wings” with the help of his children Connor and Molly. The chicken wing tasting took place on Saturday, Aug. 8. Five Ludlow restaurants competed this year: The Killarney Irish Pub with their Sweet and Savory Barbecue Wings; Mojo Café with their Dry Hopped Wings; Squeels on Wheels with their Saucey Sow and Kickin’ Sow Wings; 5 Spot Bar and Grill with their Bourbon Molasses Wings; Coleman Brook Tavern with their Pox Pox Wings. Nearly 6,000 chicken wings were consumed during the event and attendees could purchase a judging package, providing them with wing tickets for sampling entries and a single ballot for selecting their favorite. For more information, visit okemo.com.